My chilled glass of Pinot Grigio carefully set on the starboard rail of the S.V. 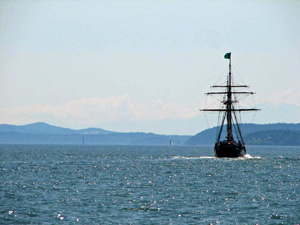 Shawmanee barely shimmied as the 65-foot ketch silently sliced through Washington’s coastal waters in Bellingham Bay. Designated the “office photographer” for the August outing, I’d skittered fore and aft capturing each of the 42 mates onboard, and now a large harbor seal bobbed its nose playfully in front of my camera. 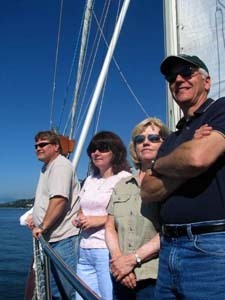 Shawmanee Charters, based out of Squalicum Harbor Marina, Bellingham, Washington, is owned and operated by Capt. Don Beattie and his First Mate and wife, Kathy. They offer chartered sailings ranging from 3-hour tours to multi-day vacations and are available for weddings, reunions, corporate retreats, employee appreciation days, graduations, and church or social gatherings. Passengers have the option of providing their own food and beverages or arranging catering services. On Wednesday evenings during summer months, the Shawmanee invites seafood lovers to their signature all-you-can-eat Chowder Charter. During this 3-hour sail, passengers are served freshly-baked rosemary bread bowls brimming with smoked salmon chowder plus an assortment of non-alcoholic beverages. Arrangements can be made at the time of reservations for alcohol requests served during the cruise or guests may provide their own. For our tour, we opted for potluck. Kathy decoratively set up two mouth-watering buffets with our brought-from-home assortment of foods and favorite desserts. On deck, a stationary cooler was loaded with complimentary waters and sodas. Wines were chilled in a washtub of ice, and a small table displaying fresh fruit and vegetable trays, bowls of chips, dips and nuts was artfully arranged. Our journey continued past Lummi Island, Portage Island and Eliza Island, with passengers snapping postcard shots of the coastal-scapes and sea-life sanctuaries. Bald eagles were spotted in tree tops, seals basked on warm shores. It was reported that approximately 90 orca whales are year-round residents of these waters; however, none spouted past us. To preserve the whale, seabird, seal and sea lion populations, 83 islands are protected by the San Juan Wildlife Refuge. The islands are sheltered from the Pacific Ocean by the rugged Olympic peninsula and pristine Vancouver Island, British Columbia. Shawmanee’s deck offered a 360-degree unobstructed view of nature’s breathtaking splendor. 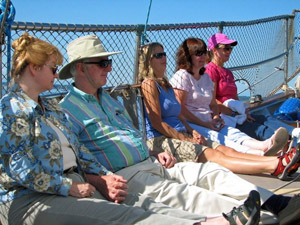 Captain Don and Kathy narrated the journey, highlighting historical points of interest, inhabited islands and particular sea bird shrills. They shared sea stories and humorous tales of previous sailings. Contact Don or Kathy Beattie at 360-734-9849 for detailed information. The S.V. Shawmanee can accommodate up to forty-six passengers for daily cruises or six for overnight stays. Children are welcome. Reservations required.